Igneous rocks are formed when magma cools in the Earth's crust, or lava cools on the ground surface or the seabed. The metamorphic rocks are formed when existing rocks are subjected to such large pressures and temperatures that they are transformed, something that occurs, for example, when continental plates collide. The sedimentary rocks are formed by diagenesis or lithification of sediments, which in turn are formed by the weathering, transport and deposition of existing rocks. The scientific study of rocks is called petrology, which is an essential component of geology. The Grand Canyon is an incision through a number of layers of sedimentary rocks. Rocks are composed of grains of minerals, which are homogeneous solids formed from a chemical compound arranged in an orderly manner. The aggregate minerals forming the rock are held together by chemical bonds. The types and abundance of minerals in a rock are determined by the manner in which it was formed. Many rocks contain silica (SiO2); a compound of silicon and oxygen that forms 74.3% of the Earth's crust. This material forms crystals with other compounds in the rock. The proportion of silica in rocks and minerals is a major factor in determining their names and properties. Rocks are classified according to characteristics such as mineral and chemical composition, permeability, texture of the constituent particles, and particle size. These physical properties are the result of the processes that formed the rocks. Over the course of time, rocks can transform from one type into another, as described by a geological model called the rock cycle. This transformation produces three general classes of rock: igneous, sedimentary, and metamorphic. Those three classes are subdivided into many groups. There are, however, no hard-and-fast boundaries between allied rocks. By increase or decrease in the proportions of their minerals, they pass through gradations from one to the other; the distinctive structures of one kind of rock may thus be traced gradually merging into those of another. Hence the definitions adopted in rock names simply correspond to selected points in a continuously graduated series. Igneous rock (derived from the Latin word igneus, meaning of fire, from ignis meaning fire) is formed through the cooling and solidification of magma or lava. This magma may be derived from partial melts of pre-existing rocks in either a planet's mantle or crust. Typically, the melting of rocks is caused by one or more of three processes: an increase in temperature, a decrease in pressure, or a change in composition. Plutonic or intrusive rocks result when magma cools and crystallizes slowly within the Earth's crust. A common example of this type is granite. Volcanic or extrusive rocks result from magma reaching the surface either as lava or fragmental ejecta, forming minerals such as pumice or basalt. The chemical abundance and the rate of cooling of magma typically forms a sequence known as Bowen's reaction series. Most major igneous rocks are found along this scale. About 64.7% of the Earth's crust by volume consists of igneous rocks, making it the most plentiful category. Of these, 66% are basalts and gabbros, 16% are granite, and 17% granodiorites and diorites. Only 0.6% are syenites and 0.3% peridotites and dunites. The oceanic crust is 99% basalt, which is an igneous rock of mafic composition. Granites and similar rocks, known as meta-granitoids, form much of the continental crust. Over 700 types of igneous rocks have been described, most of them having formed beneath the surface of Earth's crust. These have diverse properties, depending on their composition and the temperature and pressure conditions in which they were formed. Sedimentary rocks are formed at the earth's surface by the accumulation and cementation of fragments of earlier rocks, minerals, and organisms or as chemical precipitates and organic growths in water (sedimentation). This process causes clastic sediments (pieces of rock) or organic particles (detritus) to settle and accumulate, or for minerals to chemically precipitate (evaporite) from a solution. The particulate matter then undergoes compaction and cementation at moderate temperatures and pressures (diagenesis). Before being deposited, sediments are formed by weathering of earlier rocks by erosion in a source area and then transported to the place of deposition by water, wind, ice, mass movement or glaciers (agents of denudation). Mud rocks comprise 65% (mudstone, shale and siltstone); sandstones 20 to 25% and carbonate rocks 10 to 15% (limestone and dolostone). About 7.9% of the crust by volume is composed of sedimentary rocks, with 82% of those being shales, while the remainder consists of limestone (6%), sandstone and arkoses (12%). Sedimentary rocks often contain fossils. Sedimentary rocks form under the influence of gravity and typically are deposited in horizontal or near horizontal layers or strata and may be referred to as stratified rocks. A small fraction of sedimentary rocks deposited on steep slopes will show cross bedding where one layer stops abruptly along an interface where another layer eroded the first as it was laid atop the first. Metamorphic rocks are formed by subjecting any rock type—sedimentary rock, igneous rock or another older metamorphic rock—to different temperature and pressure conditions than those in which the original rock was formed. This process is called metamorphism, meaning to "change in form". The result is a profound change in physical properties and chemistry of the stone. The original rock, known as the protolith, transforms into other mineral types or other forms of the same minerals, by recrystallization. The temperatures and pressures required for this process are always higher than those found at the Earth's surface: temperatures greater than 150 to 200 °C and pressures of 1500 bars. Metamorphic rocks compose 27.4% of the crust by volume. The three major classes of metamorphic rock are based upon the formation mechanism. An intrusion of magma that heats the surrounding rock causes contact metamorphism—a temperature-dominated transformation. Pressure metamorphism occurs when sediments are buried deep under the ground; pressure is dominant, and temperature plays a smaller role. This is termed burial metamorphism, and it can result in rocks such as jade. Where both heat and pressure play a role, the mechanism is termed regional metamorphism. This is typically found in mountain-building regions. Depending on the structure, metamorphic rocks are divided into two general categories. Those that possess a texture are referred to as foliated; the remainders are termed non-foliated. The name of the rock is then determined based on the types of minerals present. Schists are foliated rocks that are primarily composed of lamellar minerals such as micas. 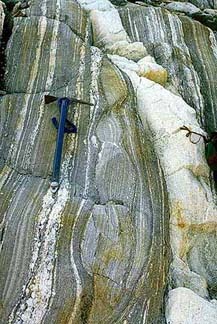 A gneiss has visible bands of differing lightness, with a common example being the granite gneiss. Other varieties of foliated rock include slates, phyllites, and mylonite. Familiar examples of non-foliated metamorphic rocks include marble, soapstone, and serpentine. This branch contains quartzite—a metamorphosed form of sandstone—and hornfels. ^ Harbaugh, John W.; Windley, Brian Frederick. "Geology". Encyclopædia Britannica. Retrieved 15 April 2019. ^ Cipriani, Nicola (1996). The encyclopedia of rocks and minerals. New York: Barnes & Noble. ISBN 978-0-7607-0291-8. ^ a b c d Wilson, James Robert (1995), A collector's guide to rock, mineral & fossil localities of Utah, Utah Geological Survey, pp. 1–22, ISBN 978-1-55791-336-4, archived from the original on 19 November 2016. ^ a b c d Blatt, Harvey; Tracy, Robert J. (1996). Petrology (2nd ed.). W.H. Freeman. ISBN 978-0-7167-2438-4. ^ One or more of the preceding sentences incorporates text from a publication now in the public domain: Flett, John Smith (1911). "Petrology" . In Chisholm, Hugh (ed.). Encyclopædia Britannica. 21 (11th ed.). Cambridge University Press. p. 327. ^ a b c Bucher, Kurt; Grapes, Rodney (2011), Petrogenesis of Metamorphic Rocks, Springer, pp. 23–24, ISBN 978-3-540-74168-8, archived from the original on 19 November 2016. ^ Gilluly, James (1959). Principles of Geology. W.H. Freeman. Archived from the original on 7 November 2017. ^ Gajul, Shekhar (28 July 2018). "Underground Mining Equipment Market 2017 Global Key Players, Share, Challenges, Industry Size, Growth Opportunities & Forecast To 2021". Journalist Book. ^ Botin, J.A., ed. (2009). Sustainable Management of Mining Operations. Denver, CO: Society for Mining, Metallurgy, and Exploration. ISBN 978-0-87335-267-3. ^ Wilson, Arthur (1996). The Living Rock: The Story of Metals Since Earliest Times and Their Impact on Developing Civilization. Cambridge, England: Woodhead Publishing. ISBN 978-1-85573-301-5. ^ Terrascope. "Environmental Risks of Mining". The Future of strategic Natural Resources. Cambridge, Massachusetts, USA: Massachusetts Institute of Technology. Archived from the original on 20 September 2014. Retrieved 10 September 2014. "AI Freaks Me Out" is the second single from Double Experience's third studio album Rock (Geology), officially released on February 12, 2018, along with a music video, on March 22, 2018. Country rock is a geological term meaning the rock native to an area, in which there is an intrusion of viscous geologic material, commonly magma, or perhaps rock salt (in salt domes) or unconsolidated sediments. Magma is typically less dense than the rock it intrudes, widening and filling existing cracks, sometimes melting the already-existing country rock.The term "country rock" is similar to, and in many cases interchangeable with, the terms basement and wall rocks. Country rock can denote the widespread lithology of a region in relation to the rock which is being discussed or observed. The term dolostone was introduced to avoid confusion with the mineral dolomite. The usage of the term dolostone is controversial because the name dolomite was first applied to the rock during the late 18th century and thus has technical precedence. The use of the term dolostone is not recommended by the Glossary of Geology published by the American Geological Institute. It is, however, used in some geological publications. The geological process of conversion of calcite to dolomite is known as dolomitization and any intermediate product is known as "dolomitic limestone. "The "dolomite problem" refers to the vast worldwide depositions of dolostone in past geologic record eluding a unified explanation for their formation. Double Experience is a rock band based in Ottawa, Ontario that was formed in the summer of 2011. The band consists of vocalist and front man Ian Nichols and guitarist Brock Tinsley. Extrusive rock refers to the mode of igneous volcanic rock formation in which hot magma from inside the Earth flows out (extrudes) onto the surface as lava or explodes violently into the atmosphere to fall back as pyroclastics or tuff.This is as opposed to intrusive rock formation, in which magma does not reach the surface.The main effect of extrusion is that the magma can cool much more quickly in the open air or under seawater, and there is little time for the growth of crystals. Sometimes, a residual portion of the matrix fails to crystallize at all, instead becoming a natural glass or obsidian. If the magma contains abundant volatile components which are released as free gas, then it may cool with large or small vesicles (bubble-shaped cavities) such as in pumice, scoria, or vesicular basalt. Examples of extrusive rocks include basalt, rhyolite, andesite, obsidian and pumice. Friability ( FRY-ə-BIL-ə-tee), the condition of being friable, describes the tendency of a solid substance to break into smaller pieces under duress or contact, especially by rubbing. The opposite of friable is indurate. Substances that are designated hazardous, such as asbestos or crystalline silica, are often said to be friable if small particles are easily dislodged and become airborne, and hence respirable (able to enter human lungs), thereby posing a health hazard. Tougher substances, such as concrete, may also be mechanically ground down and reduced to finely divided mineral dust. However, such substances are not generally considered friable because of the degree of difficulty involved in breaking the substance's chemical bonds through mechanical means. Some substances, such as polyurethane foams, show an increase in friability with exposure to ultraviolet radiation, such as sunlight. Friable is sometimes used metaphorically to describe "brittle" personalities who can be "rubbed" by seemingly-minor stimuli to produce extreme emotional responses. A gravel pit is an open-pit mine for the extraction of gravel. Gravel pits often lie in river valleys where the water table is high, so they may naturally fill with water to form ponds or lakes. Old, abandoned gravel pits are normally used either as nature reserves, or as amenity areas for water sports, landfills and walking. In addition, many gravel pits in the United Kingdom have been stocked with freshwater fish such as the common carp to create coarse fishing locations. Gravel and sand are mined for concrete, construction aggregate and other industrial mineral uses. Mount Conner, also known as Attila and Artilla, and occasionally found as Mount Connor, is an Australian mountain located in the southwest corner of the Northern Territory, 75 kilometres (47 mi) southeast of Lake Amadeus. Mount Conner reaches 859 metres (2,818 ft) above sea level and to 300 metres (984 ft) above ground level.Mount Conner is part of the vast, 1 milion acre, Curtin Springs cattle station in Pitjantjatjara country.Mount Conner is also close to the site of Kungkarangkalpa, the Seven Sisters Dreaming. The RATE project (Radioisotopes and the Age of The Earth) was a research project conducted by the Creation Research Society and the Institute for Creation Research between 1997 and 2005 to assess the validity of radiometric dating and other dating techniques in the light of the doctrine of a recent creation. It was funded by $250,000 from the Institute for Creation Research and over $1 million in donations. The RATE team was chaired by Larry Vardiman (meteorology) and included Steven A. Austin (soft rock geology), John Baumgardner (geophysics), Steven W. Boyd (Hebrew), Eugene F. Chaffin (physics), Donald B. DeYoung (physics), Russell Humphreys (physics) and Andrew Snelling (hard rock geology).The project's findings were published in 2005, and while they acknowledged evidence for over 500 million years of radiometric decay at today's rates, they also claimed to have discovered other lines of evidence that pointed to a young earth. They therefore hypothesised that nuclear decay rates were accelerated by a factor of approximately one billion on the first two days of the Creation week and during the Flood. Non-affiliated experts who have scrutinised the claims have unanimously rejected them as flawed. Scoria is a highly vesicular, dark colored volcanic rock that may or may not contain crystals (phenocrysts). It is typically dark in color (generally dark brown, black or purplish red), and basaltic or andesitic in composition. Scoria is relatively low in density as a result of its numerous macroscopic ellipsoidal vesicles, but in contrast to pumice, all scoria has a specific gravity greater than 1, and sinks in water. The holes or vesicles form when gases that were dissolved in the magma come out of solution as it erupts, creating bubbles in the molten rock, some of which are frozen in place as the rock cools and solidifies. Scoria may form as part of a lava flow, typically near its surface, or as fragmental ejecta (lapilli, blocks and bombs), for instance in Strombolian eruptions that form steep-sided scoria cones. Most scoria is composed of glassy fragments, and may contain phenocrysts. The word scoria comes from the Greek σκωρία, skōria, rust. A colloquial term for scoria is cinder. South Table Mountain is a mesa on the eastern flank of the Front Range of the Rocky Mountains of North America. Castle Rock, the 6,338-foot (1,932 m) summit of the mesa, is located on private property 0.56 miles (0.9 km) directly east (bearing 90°) of downtown Golden, Colorado, United States, in Jefferson County. Stob Bàn is a Scottish mountain situated at the western end of the Mamores ridge, five and a half kilometres north-west of Kinlochleven. With a height of 999 metres (3,278 feet) it qualifies as a Munro. Stob Bàn is a distinctive sight when viewed from lower Glen Nevis with its sharp peak and capping of white quartzite rocks which are often mistaken for snow; its Gaelic name translates as White Peak or Light Coloured Peak.Stob Bàn exhibits striking examples of Dalradian rock geology and has been identified by the Joint Nature Conservation Committee (JNCC) as an important site in its Geological Conservation Review. Dalradian rocks were characteristically formed in the high ground to the east and south of the Great Glen of Scotland. Dalriada was the name for this ancient Celtic region. The mountain should not confused with another Stob Bàn, also a Munro which is located in the Grey Corries above Spean Bridge. Stob Bàn has three main ridges: the east ridge connects to the former Munro of Sgor an Iubhair via the top of the Coire a' Mhusgain (Corrie of the Shellfish), the western ridge links to the adjoining Munro of Mullach nan Coirean while the northern ridge drops steeply to Glen Nevis over a series of terraced rocky outcrops. There is a less significant fourth ridge which gives a steep descent south west to the West Highland Way en route from Kinlochleven to Fort William and is quick way off the mountain for walkers who have approached from the south. Stob Bàn can be climbed as part of the Highland High Way, a high level alternative of the West Highland Way, walkers often do the final day between Kinlochleven and Fort William over some of the Mamores peaks if the weather is fine. Stob Bàn’s most striking physical characteristic are its crags on the north eastern face; these fall precipitously to Coire a' Mhusgain over 400 metres below and contribute greatly to the mountain’s classic pyramidal shape. The buttresses on the northern ridge of the mountain attract winter ice climbers. South Buttress has several good winter gully climbs, Central Buttress features three gully lines, a rocky rib and an arete all giving good winter climbs on broken rock.Stob Bàn is usually climbed from Glen Nevis to the north; direct ascents start at Achriabhach and take the stalkers path which ascends Coire a' Mhusgain to reach the col between Stob Bàn and Sgor an Iubhair before climbing steeply up the eastern ridge to the summit. From the same starting point it is also possible to ascend the rough and undulating north ridge; on this route there is a significant false top at a height of 900 metres which is often mistaken for the summit. Stob Bàn is also quite often climbed in conjunction with the neighbouring Munro of Mullach nan Coirean which lies three kilometres to the west. The view from the summit takes in fine views of Ben Nevis and the Aonachs. "The Pilot" is the first single from Double Experience's third studio album Rock (Geology), officially released on November 14, 2017. Wall rock is the rock that constitutes the wall of an area undergoing geologic activity. Examples are the rock along the neck of a volcano, on the edge of a pluton that is being emplaced, along a fault plane, enclosing a mineral deposit, or where a vein or dike is being emplaced. In volcanoes, wall rock can often become broken off the wall and incorporated into the erupted volcanic rock as xenoliths. These xenoliths are important to geologists because they can come from rock units that are otherwise not exposed at the Earth's surface.